The emergency response to a multi-storey blaze in Melbourne's CBD was rapidly escalated early Monday morning after it was confirmed the building had combustible cladding on its exterior. 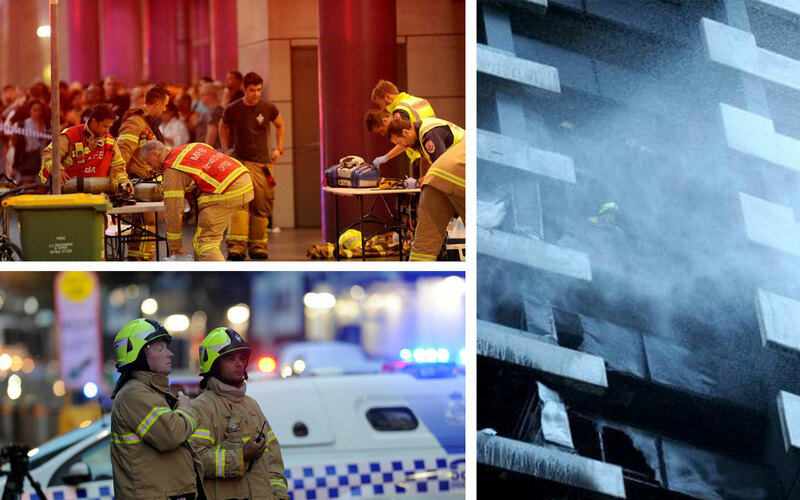 First responders were alerted to the blaze at the 40-storey Neo200 apartment tower located on the corner of Spencer and Little Bourke Street around 5.43am. The fire was upgraded, with over 150 residents being asked to evacuate, once it was established the building was fitted with non-compliant cladding material. Fifteen fire trucks, two ladder-platform trucks and more than 80 firefighters were used to extinguish the fire, which was brought under control at 6:49am. Ambulance Victoria reported that paramedics had treated one man in his 20s for smoke inhalation who was taken to Royal Melbourne hospital. Dan Stephens, chief officer of the Metropolitan Fire Brigade suggested the fire started on the 22nd floor balcony and moved up the outside of the building to the 27th floor. “My understanding is that the building is cladded with ACM (aluminium composite materials), so the cladding that was on the Grenfell Tower,” Stephens said. Stephens noted that the knowledge of cladding in buildings informed tactical decision-making and suggested upon further inspection that several internal alarms were not working. “Now, at this point in time, whether or not fire alarms have been disabled within the building that is something that would be subject of investigation by our fire investigation team and then if that were the case it’s clearly something the Metropolitan Fire Brigade would look to follow up through enforcement,” Stephens said. Stephens said other “building management issues” which were effecting the emergency response included residents who refused to leave despite repeated pleas from firefighters. The Metropolitan Fire Brigade said investigators spent most of Monday at the Neo200 apartment building in Spencer St and concluded that a cigarette probably ignited combustible materials stored on the apartment balcony. The City of Melbourne announced they were working with other agencies to investigate issues of overcrowding in apartment buildings. During inspections following the fire, the Municipal Building Surveyor observed that some apartments had more beds than would otherwise be appropriate. The blaze comes after a 2014 fire at LaCrosse tower in Docklands and London’s Grenfell fire that killed 72 people last year. Up to 1,400 buildings likely clad in aluminium composite panels with polyethylene core or expanded polystyrene were identified by the Victorian Cladding Taskforce as part of an interim report released in late 2017. Last year, Planning Minister Richard Wynne moved to ban from all multi-storey buildings cladding of expanded polystyrene and of aluminium panels with a polyethylene core of more than 30 per cent. In a move to address the issue the Andrews Labor government pushed to emplace reforms in July of last year to reduce the cost of removing dangerous combustible cladding. The scheme which was the first of its kind anywhere in the world, offered owners an efficient way to remove dangerous cladding from their buildings. Figures released earlier this month by the Victorian Cladding Taskforce identified that cladding would need to be removed from 44 buildings deemed to be at the greatest risk. The majority of at-risk buildings are two or three storeys high, have only one exit, and inadequate fire safety measures.